Dragonsgate College, that's the name of an university for apprentices for the art of dungeoneering. A lot of magic is taught there in manifold ways. Who thinks of Hogwart, the famous school of Witchcraft and Wizardry, hearing this, is not completely wrong. As in the books of J.K. Rowlings, players compete for prestige and must prove that their House is the only worthy one to train new apprentices and bring out mighty warriors that can withstand the monsters and perils of the Dragonsgate Dungeon. As head of their houses, the players have to recruit new apprentices and professors, train their protégés and raise buildings on their house's grounds. 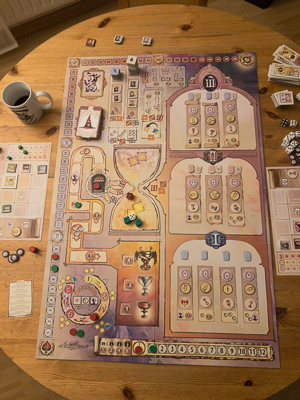 The main mechanism is based on dice-drafting, similar for example to the mechanism in Lorenzo il magnifico. So, for choosing an action, you take dice from a common pool. Without changing their values you choose actions that match the exact die value. Only with the help of an imp you can acquire during the game, it is possible to adjust the value by +1 or -1. To build up the dice pool, every player gives one of his dice (in the player's colour) to this pool at the beginning of the game. 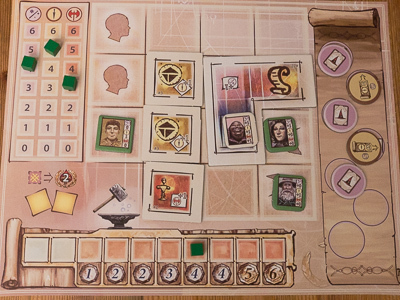 A number of neutral (white) dice, equal to the number of players, is added to it. So the game starts with the same number of player dice as neutral dice. But this will change during the game. By some actions you can exchange one of the neutral dice with one of your own player dice. In addition to that, more neutral dice are added in later rounds, and as a result, there are more available actions in the middle and end game. Coloured or neutral dice, they all belong to the same common pool that is rolled at the beginning of each new round. And each player may take a die of his choice as long as it is available (no other player has chosen that die in that round). Still it is good to have a lot of own dice in this pool. If you choose a neutral or your own die for an action, you just perform the action. If, however, you choose a die of one of your opponents, he or she may also take an action with the same die after you have finished your turn. For the fellow player this is a free action, next to his regular turn. So, this doesn't seem to be a clever move, but on the other hand, you could choose a player, who not really needs this free action (because he cannot do a lot of things with the die result). And of course, the time will come, when someone else chooses your die (because there are no other dice left). 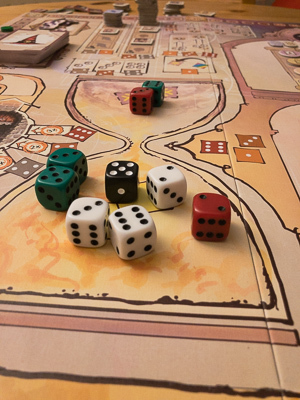 In the game, the right choice of the dice is much more important than it seems to be. A lot of players doesn't seem to notice in their first game, but in reality it is one of the most important things to consider for winning the game. Speaking about taking actions, there are quite a lot of different ones in the game. There are actions for collecting coins, getting prestige points (victory points), acquainting apprentices and professors, erecting buildings that give benefits for later turns and changing turn order. All of these actions are chosen on various areas on the general board. As said, you always have to choose a matching die to use them. As a result, not all actions will be available in each round, but some actions allow you to use several dice results to perform them. But what do you do with the apprentices, professors and new buildings? For this each player has his or her own player board, the house ground. All new tiles must be placed on free spaces of this ground. As the space is limited, you have to arrange new tiles in a way that you still have enough room for later rounds. This is important, because apprentices and professors can only be placed on special spaces, and once you have overbuild these spaces no new persons can be added to your ground. Obviously apprentices and professors are needed in a shool, but what do they do in the game? The professors are easy to explain, because they increase the house`s skills in three different disciplines: Sorcery, Stealth and Brawn. Skills can also be increased in other ways, but professors are normally the easiest and cheapest way to do so. And apprentices also have their individual skills, but they are still weak and must be taught and send to the career actions on the general board to be really helpful for their houses. Choosing a career is a very special action and deserves some more words, because it takes part in half of the general gameboard. Whenever a player performs this action, he must choose a career for one of his available apprentices. Corresponding to the house's skills there are three different careers (Wizard, Rogue, Warrior) that differ in their requirements and their individual output. To choose one of the available career tiles, a player must have the necessary skills that are composed of the skills of the apprentice himself and the skills of the house. Money can be used to compensate for missing skill levels, but of course that is expensive and usually not the best choice. There are three different levels for every career, but once a specific career action has been chosen by a player, it is no longer available in the game. If an apprentice fulfills the requirements, the career is automatically succesful. As a result, a player gains various benifits like prestige, coins, trophies for the final scoring, imps and some other things. The wizard career additionally allows the player to take a special wizardry card that can be used for various effects in later rounds. The game ends with a final scoring phase. In this phase, more than 2/3 of the victory points are scored, so it is important to know all details about it. Player aids help to keep track, but I learnt that most players will need more than one game to stay on top of the things. As a lot of victory points are given in a comparison between the players, you not only have to keep an eye on yourself, but you better regularly check what your opponents are doing. If you know how to play the game and understand all the scorings, it is sometimes better to give up one of the disciplines and go for another. And it is this necessary experience level, that makes it difficult to judge the game. In my opinion, the game becomes better with each play. What seems to be superficial after your first game, seems to make sense after the second one. For example, I personally was very dissappointed by the small improvements that each professor brings along after my first try. But then I learned that if you make room for more professors on your playing board by choosing the right buildings, you soon end up as a pro in all disciplines. And if you only take apprentices, who really help you in the career action, because they have exactly the one more point in a discipline that you need, you can spare a lot of actions and money to do more useful things. 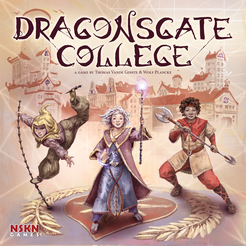 Dragonsgate College offers a lot of opportunities to gain victory points. So there is indeed a lot going on as in most other NSKN GAMES I played so far. But unlike Mistfall, the new game is not a heavy one. It may seem to be complex after reading, but everything you need is printed on the boards and cards. And the main mechanism is to choose a die matching the action you want to perform. From my point of view, the mechanism works well and is easy to grasp. But the game does not only score by this simple, but effective way to choose actions, but also by its good and extensive game material. Maybe the purple colour is not to everbody's liking, but on the other hand it is a welcome change to the standard green / brown boards. 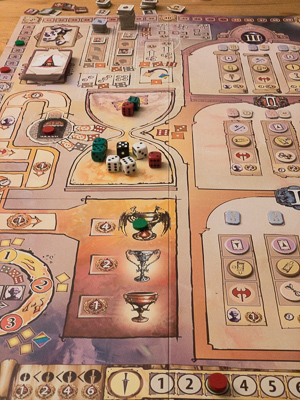 The general board is very big (no game for your coffee table) and you still need room for the player boards, the money and the buildings next to the boards. The only minor point of criticism concerning the game material from my point of view are the thin player boards that definitely could have been made of thicker material. As far as the rest is concerned, I am quite happy with the game.